In short it is an old type of dressage for horses,with great collection, ridden with one hand. The Academic Art of Riding is a system that is first of all for the horse. The riding horse, building its body so it can carry the weight of the rider in a way that is beneficial for it. Based on exercises and movements used to train the horses for war. The Dane Bent Branderup has dedicated his life to this way of riding. The word academic comes from the different riding academies that existed in Europe around the 17th and 18th centuries, where you learnt both riding, fencing, languages, dancing, etc. It is dressage for the horse, not the horse for dressage! All riding horses can benefit from this system, no matter what the breed, size, age or speciality. It is also a good tool for building up a horse, as a form of physiotherapy. 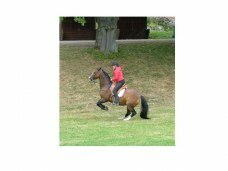 You learn step by step the different movements, ground exercises, the horse at hand and the riding part. Balance, alignment of the spine, developing the overline, collection, form, the hores carrying itself with very light contact, communicating through very very small aids. The training moves from the basics, through the schools, piaff, passage etc., up to the airs above the ground, such as croupade, courbette and capriole, all in due course. Likewise with yoga all this is a process that will take the time it takes, and to me that is always the horses time. Most people will find this difficult as they start as we are so used to our western consuming, fast, surfaced society. But after a while you will come in to the "horses world" and appriciate being close to nature. The rider learns to listen to the horse through her/his body. Therefore a great emphasis is put on the basics, both for horse and rider, but actually the horse already knows it all, it is we who need time to understand and develop the way we communicate with the horse. It is one thing to understand in theory and another feeling it in your body and heart. Less is more. As sometimes referred to in the old days it is riding for body, mind and spirit! You start by teaching your body by using your mind, after a while there is less mind, more meditation/relaxation and by that your spirit will develop! For me it is a system with a holistic approach, a soft and delicate philosophy yet with great strength and power, communicating through the nerveous system of horse and rider,with focus on the sensitive nature of the horse. It is possible to book a course, Birgitta is the one who teaches this riding (see presentation for futher info), you can also come to us and be a "week student" bringing your own horse. Birgitta also takes horses in for training.